It's only this morning, having chosen and scanned the images for this post yesterday, that I've remembered Tom Paterson took over the Buster strip from Reg Parlett in the mid 1980s and produced many brilliant, bouncing, bonkers covers for the cloth-capped scamp. I should have included at least one of those here. But I love Sweeny Toddler so much, and Tom's treatment of him for both Whoopee! and Whizzer and Chips, that I got a bit carried away. Sweeny Toddler was created for Shiver and Shake by Leo Baxendale but Tom became principal artist on the strip after the demon baby switched to Whoopee! The combination of his energetic, madcap, anarchic style and Sweeny's maniacal diabolism made this strip a true classic of British comics. Every panel seems to wibble and shudder. Me adore this stuff! 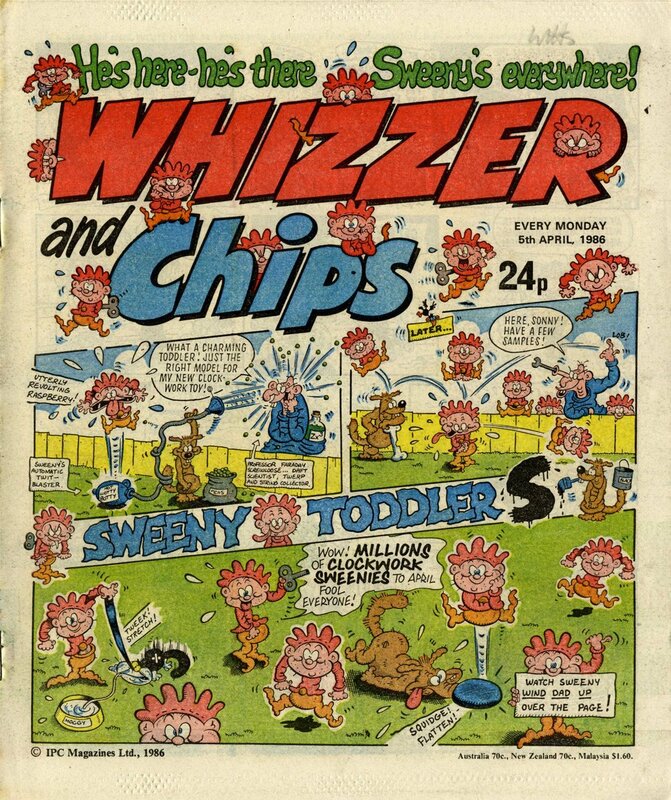 For many years Sweeny was restrained by a formulaic front cover design on Whoopee!, but in the mid-1980s he broke free of this and made the cover (and often the comic's masthead) his own. This continued for a few years after Whoopee! was merged into Whizzer and Chips and Sweeny remained the page one star.